File photo of Abu Sayyaf terrorists in the southern Philippines. Ten Abu Sayyaf terrorists and two soldiers were killed and 14 others wounded in an hour-long gun battle in the province of Sulu. Brigadier General Cirilito Sobejana, Joint Task Force Sulu commander, said the firefight began at about 6.15am yesterday (Sunday, May 13) in the Patikul municipality. He said the troops were on security operations aimed to rescue kidnap victims when they clashed with a combined group of Abu Sayyaf fighters. Brig. 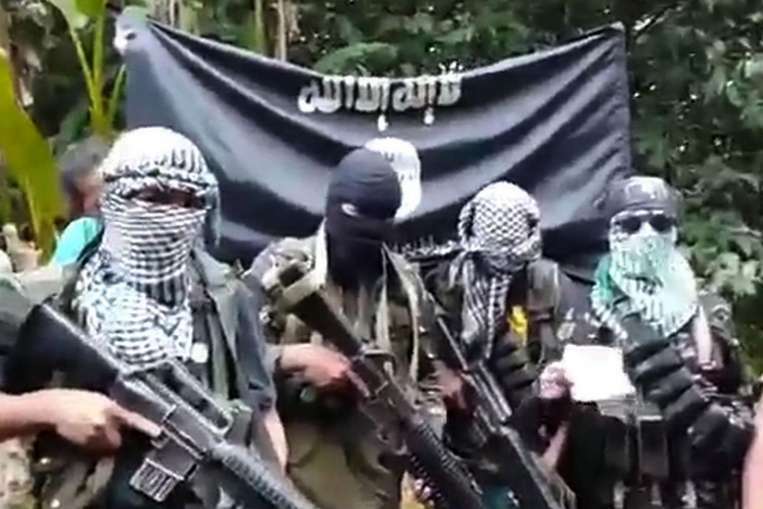 Gen. Sobejana said the Islamist terrorists involved in the battle were followers of Abu Sayyaf sub-leaders Hatib Hajan Sawadjaan, Idang Susukan, Injam Yadah and Ben Tattoh. “We delivered artillery and mortar fires to pin-pointed enemy locations. Our actions are however limited and calculated since we do not want to harm the kidnap victims,” he added. The firefight lasted for about one hour before the Islamic State-affiliated fighters scattered. Four of the 10 slain terrorists were identified as Amah Talah, Taha Sawadjaan (the younger brother of Hatib), Long Abraham and a man known as Abu Red. He said two of the 14 wounded were Abu Sayyaf members, namely, Ben Quirino alias Abu Ben Tatto and Adzren Sawadjaan. The Army spokesman did not identify the two slain and 12 wounded soldiers pending the notification of their families. However, he did confirm they both belonged to the Army’s 5th Scout Ranger Battalion. Their bodies have been transported to Zamboanga City. He also said the troops have recovered from the clash site one M-16 “Baby Armalite” rifle, bomb-making components including canisters of ammonium nitrate, cell phones, batteries and electronic mechanisms. The terror and crime group are holding 12 hostages on Sulu, including five foreigners — these are three Indonesians, one Vietnamese, one Dutch and seven Filipinos. “We will sustain our efforts until the last kidnap victim is rescued and the ASG is neutralised,” Brig. Gen. Sobejana vowed. Earlier this month, we also reported on the death of nine Abu Sayyaf fighters in clashes on their other island stronghold of Basilan. Bramovich: What is Duterte’s problem with the USA? Or is he just high?